Every “maker” knows that it's a long path from idea to product. Follow perfumer Quentin Bisch and learn how a new Victorinox fragrance is created. When you look at a bottle of fragrance, it looks oh-so-glamorous, effortless and impeccable. However, the path to get there is anything but smooth. It’s hard work. Just as the old saying goes: success is 10% talent and 90% sweat. Except that in the fragrance business, it smells a lot better. We visited Quentin Bisch, a successful perfumer and followed him as he created the latest Victorinox fragrance, Swiss Army Rock. We wanted to know how a perfume maker works, what challenges are faced. And yes, Quentin is the best proof that success is based on relent-less trial and error, constantly questioning and re-evaluating, falling and getting back up again. Follow perfumer Quentin Bisch as he creates a new fragrance, take a look behind the curtains of the perfume industry and learn what it takes to succeed as a “Maker”. One part of Pierre’s job as an “Olfactory Artistic Director” is to listen to his clients, understand what they want, and to help bring their ideas to life. And this is what he has been doing for years with Mugler, Azzaro, Chloé and Miu Miu, to name just a few. After Pierre meets with the Victorinox fragrance team and understands our vision, he converts it into an olfactive brief that will spark a perfumer’s creativity. Swiss Army Rock is something mineral, masculine, fresh, very textured – those are the words he uses. And whereas a normal person just says “pardon me? !”, a perfumer immediately smells something in his head. Once it’s clear what the new fragrance has to embody, it is time to talk to the perfumers. Pierre briefs several artists from around the world. Because scent is such a personal matter, each creative has their own interpretation of the task. “Many talented perfumers work on the same briefing. Therefore it’s extremely rare that your fragrance makes it to the shelves,” Quentin Bisch explains. He is one of the many perfumers who have been given the task to develop Swiss Army Rock by Pierre. Since 2011, Quentin has been working in Paris for the Swiss scent company Givaudan, which is one of the most respected in the perfume industry. Quentin himself is very well known in the business. But he took a long and winding path to get there: before launching his current career, he was running his own theatre company. However, when he could no longer hide his fascination with fragrance, he left it all behind to study at the world-renowned Givaudan Perfumery School, also in the French capital. Givaudan only takes a handful of students per year, if any. One of the first tasks assigned to the students is to learn 500 scents by heart, or rather, by nose. “In my first year, I basically lived in a cave; it was just me and these scents,” Quentin recalls. But the struggle was worth it. After graduation, he got a job at Givaudan and has created several internationally acclaimed fragrances, including Angel Muse for Mugler, and Missoni’s new scent for women. After picking up the briefing from Pierre, Quentin starts his research. “It’s a captivating process; everything is open,” he says. “I search the internet for words like ‘rock’ or ‘Swiss mountains’ and print out the images I find. Wherever I go in my everyday life during my days of research, I take notes on my smartphone. Then, the search slows down and Quentin starts processing the information gathered. And that’s where the creative magic starts. This process lasts a few days and ends with a big finale: a formula. After a few days of reflection, Quentin creates a fragrance from the feel he gets of Swiss Army Rock. This all happens in his head. Just like a composer can hear the music in his mind, Quentin can smell his creation without mixing any real scents. The result: a list of ingredients with specific measurements. It’s called “the formula” and it looks very much like a recipe for cooking. But instead of two eggs and 200 g of flour it’s 10 g of rose and 50 g of musk, for example. Over the course of many trials, this formula will evolve until the best balance is found. Now it’s time for Sophie, Quentin’s lab assistant, to do her part. He hands her his formula so she can mix the magic potion in the lab. “Not long ago, I was in Sophie’s place,” Quentin recalls. At first, he was rejected from perfumery school because he had neither a chemistry degree nor any experience in the industry. So he started his career as a lab assistant. The lab is usually equipped with all the scents Quentin works with. “Sophie knows exactly, what I am looking for,” he says, smiling. A fragrance goes through different stages as it is worn. The top note is the first impression when applying a fragrance. The middle note adds depth. The base note is the scent that stays for a longer time. Quentin’s first trial already includes all these layers. “For Swiss Army Rock, I started with artemisia and lavender. Together, they create the airy feel of the mountains,” he recalls. Cedar wood and incense are also present to create a woody aura. After mixing Quentin’s formula, Sophie brings the result back to him. Now, he has to work out the different stages the fragrance goes through as it develops. “The first formula is just a raw idea,” he explains. “Now we have to create more depth.” He uses cumin and nutmeg to add a spicy aspect to the fragrance. They also build in a contrast to the artemisia and the lavender, which creates a vibrating sensation. A few weeks have passed since Quentin got the briefing for Swiss Army Rock. The scent is not finished, but has been developed enough to present to the client. Together with many other scents, Pierre Aulas hands Quentin’s potion over to us. At Victorinox, the fragrance team meets and sniffs all the samples with great care and focus. 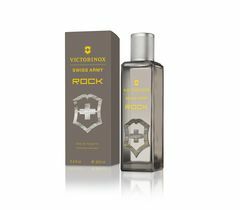 In the case of Swiss Army Rock, a handful of fragrances that the team wants develop further are chosen. Among them is Quentin Bisch’s sample. After the first presentation, Pierre and Quentin go back to work. Now the skeleton is defined, but months of adding and subtracting follow. For example, Quentin takes his skeleton and starts creating various samples highlighting different aspects. He then presents these very similar trials to Pierre. For example, in one sample he added more artemisia. This is what their conversations sound like. And so, Quentin and Pierre go through different variations, always in close discussion with Victorinox. At the end of the process it is clear that Quentin has captured the feeling of Swiss Army Rock perfectly. While the final touches are being added to the fragrance, the development team at Victorinox starts work on the bottle. Packaging is extremely important and takes just as much time as creating what will be inside the bottle. The development team comes up with an innovation by manufacturing the Victorinox Cross & Shield emblem out of real stone. Meanwhile, Givaudan, the creator of the scent, starts sourcing the ingredients in the quantities needed. So all will be ready for the big launch day. The big launch day came in fall last year. We now proudly present Swiss Army Rock. This masculine scent combines a vibrant note with a mineral accent to offer an edgy yet cultivated fragrance that evokes adventure. One look at the stone Victorinox emblem on the bottle and you’ll know that this is a fragrance for men who live life to the fullest. What’s it like to be a perfumer, Quentin Bisch? It’s the moment I give a sample to the client. I remember the meeting with the Victorinox team, when one person had this spontaneous reaction of “oh, this reminds me of that hike I took as a child with my grandfather.” I love the human communication around a scent. What is the most blissful moment of your job? It’s extremely difficult to get selected for a project, but that’s also the fun part of it. It’s so rare that you win, but when you win, it feels great. The most difficult part of my job is understanding what my client wants. Once I understand their vision, I can just translate this into a fragrance. But getting the feel of what they’re looking for – that’s extremely challenging. Therefore, most creations don’t go anywhere and we have to keep trying. What skills does a perfumer need? You have to be curious and willing to keep learning. You have to be very open and always adapt yourself to new situations. Most of the time, the briefing changes while you are working on a fragrance. So during the process the client decides, “oh no, it should not be fresh; it should be warm.” So you have to adapt your formula and reinvent the fragrance. And of course you need to be persistent. You will lose out on so many of the projects you work on but you have to keep trying. How do you learn so many scents by heart? I spent six very lonely months studying all the scents. I associated them with images or stories or sensations that would come to my mind so I could remember them. For example, a scent that evokes something very green and dewy, or one that I associate with my grandmother’s garden. Is there a Quentin Bisch “style”? I use a certain range of ingredients that I understand well. So you could say that I have my own palette. But calling it “my style”? I consciously don’t overanalyze because I need to protect my spontaneity. Perfume is a very emotional art and has to remain spontaneous. Can you smell if a fragrance is of good or bad quality? If two fragrances are made from the same formula but one uses cheaper ingredients, I can smell the difference. Quality matters, as beautiful raw materials will shine through. Therefore the perfume will be far more beautiful and subtle. How do I choose a fragrance that is right for me? You have to try out many fragrances, follow your instinct and trust your intuition. Apply it, wear it for a day and see how you like it. What fragrance do you use for yourself? Unfortunately, I don’t use any fragrances any more. I use my own trials on the weekend because I need to check them. At work, I cannot wear any perfume because I would be polluted. That’s something I’ll enjoy again when I’m retired. But until then, I hope there are many new and exciting projects coming along.